Last week at Mobile World Congress and 4FYN, we were delighted that our CEO and founder Imogen Wethered was awarded the 2016 Women’s Age Award from Telefonica Open Future. The award was Telefonica’s way of recognising the significant achievements of a female founded company that they support. We were truly delighted that Telefonica recognised Qudini’s significant developments over 2016, as well as the growth of our energetic leadership team. 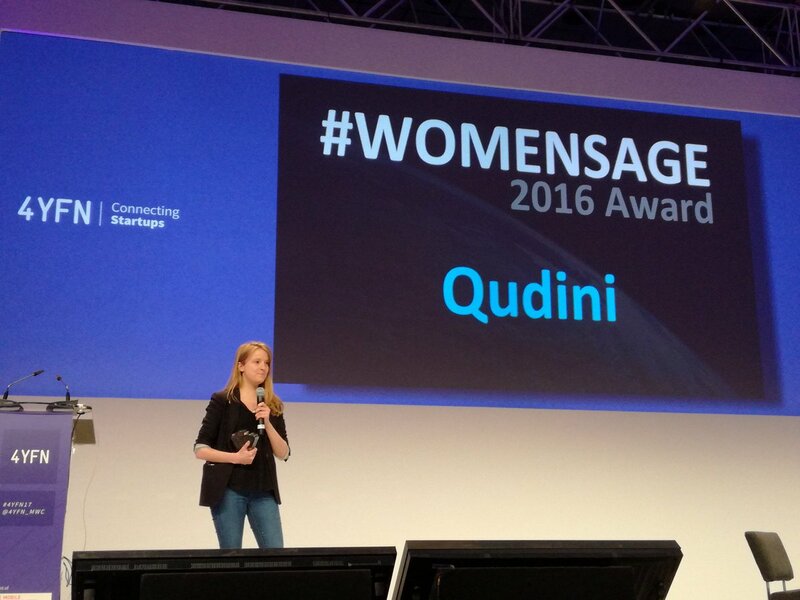 Imogen’s acceptance speech stated that: “Telefonica has always been so pivotal to Qudini’s story. Having developed the business out of winning a hackathon and mentoring from O2 and Telefonica. Before becoming a member of the Wayra Accelerator and being fortunate to have Telefonica become a shareholder in Qudini. To eventually winning competitive tenders that enabled us to work with O2 UK and Telefonica Global as a customer of Qudini’s. They have helped Qudini to grow our business to significant heights at an early stage. So as a fantastic customer and investor, we are so pleased to be recognised by them for our efforts.